Anna Mirzayan is a graduate student in Theory and Criticism, where she focuses on feminism and Marxism. Her writing uses the idea of theory-poems—- using poetry to work through complex scholastic texts and to generate new language at the intersection of poetry and academia— to explore the queer femme experience in this capitalist hell world. She is obsessed with sci-fi and cyborgs. 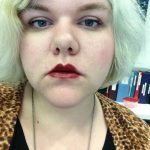 You can find her on Twitter @brekekexkoax or read some of her other work at The Stockholm Review, Bluestockings Magazine, and Carcinogenic Poetry.